Facebook launched its virtual currency Credits in June 2011 to simplify payments. In reality, Credits caused headaches for international payments due to fluctuating exchange rates. But last night, the sun set on Credits and Facebook completed its transition to local currency payments. It will help developers and Facebook make more money, smooth payments, and solidify Facebook as an international app platform. The logic behind Credits looked good on paper. Facebook wanted to start earning a 30% cut on purchases made in games played on its website like Apple and Google earn on iOS and Android in-app sales, so it needed a standardized payments system. But rather than have people buy things in their local currency, Facebook launched Credits — an intermediary virtual currency that cost $0.10 each that could then be spent on virtual goods or game-specific currency. If it sounds like a bit of a rigmarole, it was, but there were some benefits. First, users didn’t have to transact with game companies directly. They could rely on Facebook’s security and brand name rather than sending money straight to small developer shops they might not have heard of. Credits also leveled the playing field between developers. Rather than say buying proprietary virtual currency from Zynga that you could only use in its games, you’d buy Credits that were more liquid and could be used in any game. The idea was that this would help small developers get more paying players and prevent users from getting their money stuck in specific games. This worked pretty well when Facebook’s developer and user base was more concentrated in the United States, but since 2011 Facebook has seen huge growth overseas in both categories. That meant serious problems for pricing goods within games. Let’s say you price a virtual cow for 20 Credits. In the US that comes out to a nice, round $2. But that’s 63.29 Thai bhat. If the exchange rate changes, so do the actual prices of all your goods when they’re sold internationally. This caused confusion for users who thought the devs were hiking prices or putting things on sale, which may have caused purchase hesitation and conversion rate decreases. And since developers had to set the same price for the whole world, a 30 Credit power-up might seem moderately priced in the UK, but too expensive for a gamer in Vietnam. 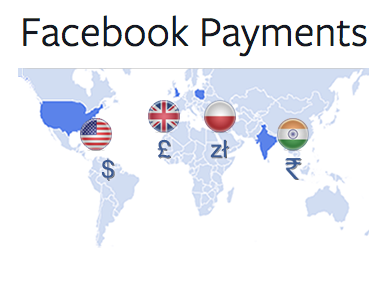 So Facebook announced in March that it would be transitioning from Credits to local currency payments. This lets developers price their goods dynamically in different regions around the world. When users see something they want to buy in a game, they just click “Buy” and Facebook lets them pay with a credit card, PayPal, mobile payment system like Zong, gift card, or other method. Liu says “We put a bunch of work in to speed up the call back and reduce latency and make it faster to render the payment flow, and make the purchase.” That means games run faster, and payments go through faster. And don’t worry, if you had previously bought Credits, they’ve been converted into balance you can spend from. Rather than having to go through the process of buying Credits, users just buy the goods they want directly. Eliminating that step could increase purchase frequency. There’s no extra mental jump required to figure out how much goods costs. Instead of being obscured through Credits, users see prices in the actual amount of local currency they’ll pay. Less thinking, more buying. Developers can price virtual goods based on the buying power of the local population. High prices in first-world markets, lower prices in developing markets. This lets developers maximize purchases while making their goods accessible to everyone. And since Facebook earns a 30% cut on each of these purchases, the more people buy in third-party games, the more it earns. Perhaps the only downside to the switch was asking developers to do extra work to transition. Facebook had extolled the virtues of Credits for years, then seemed to suddenly flip-flop. Facebook’s already known as a bit of an unstable platform to build on, where viral channels and features change quickly, and killing off Credits only exacerbates that perception. Still, the move was necessary if Facebook wanted to keep growing its payments revenue, which hit $214 million during Q2 2013. Long-term, local currency payments could also pave the way for something really big: the ability to buy real things around the Internet through Facebook. Last month Facebook began a test with ecommerce app JackThreads where you could ‘pay with Facebook”. Essentially, you’d authenticate with your Facebook email address and password, and the social network would auto-fill your credit card and billing information to speed up the purchase process. Your payment would still be processed through PayPal or whatever processor a third-party ecommerce app chose, but Facebook would help mobile reduce typing. In exchange, it got to see if your purchase stemmed from a click on an ad on Facebook, which helps it prove return on investment to advertisers and get them to buy bigger campaigns. Credits made some sense for games, but if Facebook wants to get into real commerce, local currency is the way to go. And with CEO Mark Zuckerberg saying Facebook’s mission is now to connect the 5 billion people without Internet, and most of its user growth is coming from places like Brazil and India, the sunset of Credits could mean a new dawn for Facebook commerce around the world.